Having spent most of the summer of 2012 organising a 2013 trip to Tanzania, a short-haul birding trip was put on the back burner. It wasn’t until we went to the Birdfair and a chance meeting with the folk on the Birding Extremadura stand, that the spark of excitement was ignited enough for us to instigate arrangements. Although we have visited the area twice previously, we hadn’t visited in late autumn when all those special species of the region, sandgrouse, bustards, larks and cranes congregate in large flocks - hopefully making them a little easier to locate and photograph. There are a number of very good birder-friendly accommodations in the region with several run by birders who offer everything from just accommodation through to guided holidays tailored to your requirements. 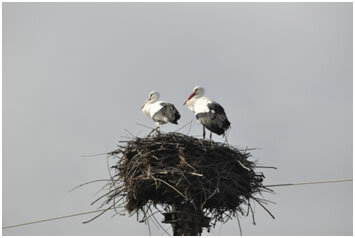 All have unique knowledge of the area and are happy to advise on the best locations of the birds. Our choice was “Casa Rural El Recuerdo” which is owned and run by Martin & Claudia Kelsey. Martin was on the stand at the Birdfair and his easy nature and knowledge of both the region and birds convinced us that his establishment was ideal for us. With Madrid being the nearest airport by a couple of hundred kilometres, we were once again forced to travel down to Heathrow in order to get a direct flight. Our chosen carrier was British Airways. Our flight left from Terminal 5 on the 1st of November returning on the 11th. Return cost for the two of us was £314-70 travelling economy, this also included being ripped off to the tune of £40-00 for the 2 of us to sit together!!! Casa Rural El Recuerdo is a traditional house of the region; it has been sympathetically restored with authentic materials and decorated with beautiful furniture of the period. The property is situated in the hamlet of Pago de San Clemente, just 11K from the wonderful medieval town of Trujillo, which to our mind has the finest town square in all of Spain. The property contains 6 double bedrooms, 4 in the main house and 2 in the annex. Choices of twin or double rooms are available. Casa Rural El Recuerdo is situated in a rural area surrounded by olive groves and within comfortable reach of most of Extremadura’s best birding spots, making it an ideal base from which to explore the region. Our preferred guides for the trip were Birdwatching Guide to Extremadura - John Muddeman, Finding Birds in Northern Spain - Dave Gosney and Where to Watch Birds in Spain and Portugal - Laurence Rose. Our day started at 04.30 as it usually does when flying from Heathrow. The overnight rain had stopped and we made very good time completing the journey in just 90minutes. Our flight left smack on the button and we arrived at Madrid 10 minutes early. That was where the good news ends. Madrid airport is a nightmare. We flew into Terminal 4, we then went up 2 flights of escalators to passport control, then back down to ground level to catch the train to the baggage hall which was, yes you’ve guessed it, back up two more flights of escalators, we then had to catch a bus for a 15 minute ride to Terminal 1, stopping at Terminals 2 &3 en route; Terminal 1 is where all the car hire companies are. This tour of the whole airport took a little over an hour and a half, with at least half of that time on foot. Hertz, our rental company, was very efficient and we were soon heading south down the M40/E5. Our journey was uneventful and took a little over 2hrs. Birds were very scarce and our only sightings were a single Red Kite, 3 high flying Common Crane, several Magpie, Wood Pigeon and a couple of large flocks of both Lapwing and Starling. On arrival at our destination we were warmly greeted and shown to a spacious en-suite room where we freshened up before our welcome evening meal which was accompanied by a very acceptable “red”. Today dawned dull, overcast and not very warm. After a breakfast of cereals and toast we decided to bird the local patch, so we started with the Belen Plains, a 20 minute drive from our accommodation. Although the birding was less than spectacular there were some very acceptable highlights; over 40 Griffon Vultures plus a lone Black Vulture squabbling over a kill, until a large feral dog decided he wanted a piece of the action. A solitary Golden Eagle sat motionless on a large boulder whilst a red fox, oblivious to its presence, approached to within metres. Judging by the eagle’s very full crop, the fox was a very lucky boy. The second part of the day was spent on the Santa Marta loop. Here we encountered a flock of 60+ Pin-tailed Sandgrouse giving great scoped views, but too far for our photographic equipment. The same had to be said for the 4 Little Bustard seen in the same area. Where trees were prevalent, gangs of Azure-winged Magpie ruled the roost. Large flocks of assorted larks were also observed, as well as an assortment of raptors which included Griffon Vulture, Black Vulture, Common Buzzard, Red Kite, Kestrel and Merlin. A full trip list of daily sighting accompanies this report, special daily sightings will be added to the report in order to emphasise the attraction of each site visited. The day broke grey with a heavy drizzle, the village church spire barely visible through the thick mist. Breakfast was taken at 08.00am and consisted of the same as the previous day. Undaunted by the unpromising weather we set out after breakfast on a route recommended by Martin. We took the Ex208 from the village through the town of Zorita turning right onto the X378; this took us on to the plains to the town of Campo Luger. 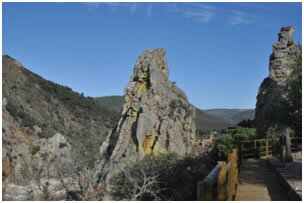 Here we did a circular route taking in Puebla De Alcollarin, Palesazuelo and connecting back with the X378. We stopped for a welcome cup of coffee at the Dehesa Moheda Alta which is a reserve mainly for the Cranes which are fed with grain allowing good sightings from the various tower hides. We visited the Embalse De Sierra Brava Reservoir, which holds many thousands of duck through the winter, before returning back to our digs. The rain was on and off for most of the day but didn’t spoil the birding; we had our first large flocks of Common Crane as well as White Stork, and both Cattle & Little Egrets were encountered in good numbers together with a smattering of Grey Heron. Although wader numbers weren’t great we still managed to see Black-winged Stilt, Kentish Plover, Dunlin, Snipe and Green Sandpiper. We had great views of both Hen and Marsh Harrier and were stopped in our tracks by the post-breeding colours of both Red Avadavat and Waxbill. Reservoir sightings included Mallard, Shoveller, Gadwall, Widgeon and Teal, together with several Great-crested Grebe. Altogether a thoroughly enjoyable days birding despite the poor weather. The dull overcast conditions did however put paid to any decent photography. A fine evening meal concluded another enjoyable day. With heavy overnight rain and still bucketing down at breakfast we turned to Martin for inspiration. 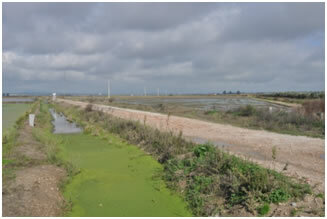 Martin’s recommendation was Arrocampo Ornithological Park. Martin’s reasoning was that it was a reserve with great potential birding-wise: it consisted of a large reed fringed lake with 5 hides each reachable by car so no matter how inclement the weather became we were assured of some dry, worthwhile birding. The reserve was approximately 60k up the motorway towards Madrid. Having completed our usual breakfast of toast and cereals we waited for a break in the weather and left. The road out of the village was like a raging torrent of brown muddy water. By the time we hit the main road we had left most of the water behind and after 20k on the motorway we had left most of the rain behind. By the time we got to the reserve the rain had stopped and we were left with overcast muggy conditions. Obtaining the key from the bar in the village, (all hides are locked) we drove to Hide No 2 recommended by Martin as one of the more productive hides. The hide looked out over small pockets of open water and extensive reed beds. From here we visited Hide No 1 and we also visited Hide No 5, another of Martin’s recommendations. It would be true to say that birding was again less spectacular than we had hoped for, but we still managed several memorable views of Bittern, Black-winged Kite, Purple Gallinule and Great Egret. Several new trip ticks were also observed; these included Kingfisher, Grey Wagtail and Mistle Thrush. A quick look through the impending gloom at the Belen Plains before returning to our digs produced nothing of note. As the song says “what a difference a day makes”, gone were the grey skies and rain, a clear blue sky greeted us on day 5. We had arranged for Martin to guide us today. Martin suggested we did the track to the south of Santa Marta, Taking in the reservoir at Talavan and then heading towards Monroy before heading back toward Santa Marta. Although the day retraced some steps taken earlier in the week we visited enough new sites to make the day very enjoyable. We particularly enjoyed our walk around part of the Embalse De Talavan a well established reservoir, with reed fringed bays and shallows making it attractive to ducks, herons and waders. As with most of this holiday the birds were extremely wary, making our approach for photos almost impossible. Birds of note seen and enjoyed during the day were Bonelli’s Eagle, Short-toed Eagle, (a very late bird), a hunting Sparrowhawk, Water Rail, Spoonbill, Greenshank, 100+ Great Bustard and Little Bustard. A hunting family party of Egyptian Mongooses added spice to the day as well as the pair of Water Rail actively swimming across a large channel of open water. All in all, another very, very enjoyable days birding. 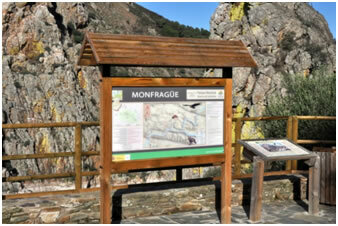 With dry clear conditions, a day in Monfragüe seemed the obvious choice. We left at 08.30 for the 40 minute drive to the reserve. First birds of note were a small flock of Common Crane feeding in a field adjacent to the road. We arrived at Peña Falcon to find no other cars in the parking bays. 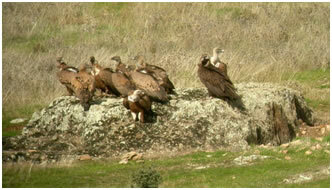 The massif was full of roosting Griffon Vulture obviously sunning themselves in the early warming rays of the sun. In fact, some birds appeared to be prostrating themselves on the rocks with feathers raised, obviously speeding the warming process up. Afew early risers were already on the wing, soaring around the summit. Several of these birds were Black Vulture, perhaps their dark plumage allows for swifter warming up. Taking in the spectacle that is Peña Falcon, we moved off to a location Martin had identified as a good spot for Spanish Imperial Eagle. 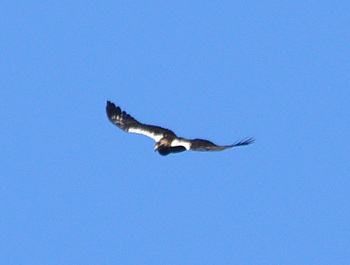 Within minutes of arriving we had an eagle wheeling in the sky amongst the vultures. The eagle appeared in a playful mood as he would position himself, undercarriage lowered, directly above a chosen vulture, almost piggy-backing; bored with this he began sky dancing before landing on a large bush. It was then that we noted a second eagle in the same bush enthusiastically tearing into flesh. Our first bird stood looking envious but unable to join the breakfast table. Spending a couple of hours enthralled with such privileged views we retraced our steps stopping at several likely looking picnic sites hoping to find a few more approachable birds to photograph, but with very little success. We had a light lunch at the Pension in Villarreal de San Carlos before retracing steps back to Peña Falcon where, briefly, we had the massif to ourselves again. A Peregrine Falcon and Firecrest were also notable birds seen. Before returning to Casa Recuerdo we stopped off at the field on the Monroy road where we had had both species of bustard the day before. They were still there with Little Bustard in far greater numbers than previously. Once again superb scoped views were obtained in the soft early evening light, but again out of reach of the camera. With the return of the dull & wet weather we decided to return to the rice fields, retracing our steps of Day 3. The rain was light but persistent for most of the day. With low cloud, visibility was reduced to less than a couple of hundred yards from the road. Bedraggled Buzzards stood sentinel on fence posts whilst large flocks of Starling, Lapwing, larks and pipits were feeding in the gloom. 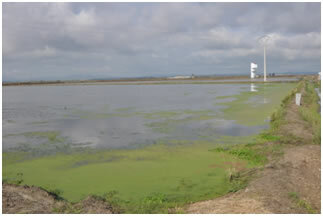 The flooded rice pans at Puebla de Alcollarin were again our salvation and where we spent the majority of the day. Sitting in the vehicle balancing a hand held scope on the door is no aid to identification, but it was either that or getting soaked. Where the water levels allowed small waders were abundant, especially Little Stint whose numbers totalled many hundreds, good numbers of Common Snipe and Black-winged Stilt were also present together with small numbers of Little-ringed Plover, Ringed Plover, Green & Common Sandpipers and a single Redshank with a damaged Leg. Several tractors were ploughing up the rice fields; these were accompanied by hoards of squabbling gulls, egrets, White Stork and herons. An hour’s stop at the site that had previously produced both Red Avadavat and Common Waxbill produced nothing so we returned to the grid of rice fields between the N430 and the town of Madrigalejo. Several thousand Common Crane were encountered here together with Marsh Harrier, Buzzard and Common Kestrel all hunting over the fields, successfully too, if the amount of birds seen carrying prey was a guide. It was a hunting harrier that put up 5 Black-bellied Sandgrouse, our first for several days. On our return back to Casa Recuerdo, whilst passing through the plains before reaching Zorita we had a flock of 20+ Little Bustard, the same number of Pin-tailed Sandgrouse and 5 Great Bustard on the skyline. Once again despite the poor weather another good days birding was enjoyed. Heavy rain and poor light conditions curtailed our visit to a little over an hour. We had already delayed the days birding to mid morning, waiting for a weather break and we were back by 12.30 somewhat soggy. We did however manage to relocate the flock of Pin-tailed Sandgrouse which gave excellent scoped views even through the gloom. 30+ newly arrived Golden Plover were added to the trip list and a Dartford Warbler gave us the run around, alighting on tops of small bushes tantalisingly close to the vehicle before diving for deep cover the moment the camera lens came anywhere close to the car window. Birding was restricted to the bedroom window for most of the afternoon, even so, that produced 2 new trip ticks: a Short-toed Treecreeper and a Brambling, a new bird for Martin’s garden list. A late afternoon walk around the village produced nothing new although we did have an opportunity of taking a shot of a Hoopoe flaring his crest. Tomorrow dawns another day and we hoped for more agreeable weather. With yesterday’s birding washed out and a forecast of dryer weather, we decided to bird the Belen Plains in the morning and then return to the Santa Marta de Magasca loop in the afternoon. With Belen a 20 minute drive from our digs, we arrived a little past 09.30. Visibility was reduced by a thick fog which Martin had assured us would soon clear and by 10.00 visibility was no longer a problem. The only new trip tick was a pair of Woodlark chasing each other around some broken bare branches below a large mature Eucalyptus tree. 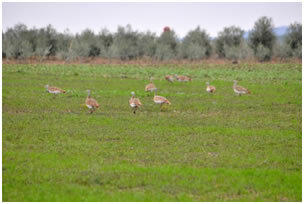 Little Bustard were located and fair scoped views were enjoyed. A Little Owl played "now you see me now you don’t" behind a large pile of boulders. Several Griffon Vultures had taken to the air by 11.30: Red Kite are the most numerous raptor on the plains and many were seen during the day, both Common Buzzard and Kestrel are also regularly seen in fair numbers. After a light lunch of chicken wings and salad we embarked on the trip to the Santa Marta track which we had abandoned the previous day. All the usual suspects were encountered with pride of place going to the dozen or so Great Bustard. These birds were still in the same field as 2 previous visits but were appreciably closer, giving an opportunity of at least a photo of report quality. A confiding Rock Bunting was our second new bird giving us a respectable total of 112. Having birded the Rice Fields twice previously this trip in pretty poor conditions, we were hopeful that a better forecast would enhance our last day’s birding. Well it’s official, the Spanish are no better at forecasting the weather than our own Met Office. Grey scudding clouds with intermittent light rain and a cold wind prevailed throughout the day. Another day when the car heater was essential, especially after spending an hour in the elements, trawling through several hundred distant waders. We had also intended to spend at least an hour trying to identify the thousands of distant ducks on the Embalse De Sierra Bravo reservoir which holds the majority of Extremadura’s wintering wildfowl. Again 20 minutes was enough in the cold, damp murky conditions and only Pintail was a new trip tick although we are sure we left some ducks unidentified. Despite the conditions 3 new trip ticks were added to the list, Pintail, Water Pipit and Stone Curlew. Several sought-after birds were seen very well, Black-bellied Sandgrouse again obliged with close fly bys. Great Bustard were the closest this holiday allowing for some camera work. Two hunting ring-tails also gave excellent views. A Black-winged Kite on a roadside electric pole was stunning, but no stopping restrictions and traffic conspired to cancel what could have been a great photo opportunity. Our total for the holiday was 115, all the specialties that the area is renowned for were seen and most gave excellent views. Our stay at Casa Rural De Recuerdo was a delight. Our hosts Martin and Claudia were very attentive, providing comfortable beds, great food and a warm homely atmosphere. Martin provided all the birding information we required to make our stay a successful one, with hand drawn maps, tips on best routes and even the odd recommendation for a lunch stop. We were joined in our rural idyll on Day 5 by 6 birders from Britain, their enthusiastic banter and fireside discussions of a more topical nature were a very welcome addition to our stay. Many thanks to Joan (proxy leader & scribe), Carol, Peter, Margaret, Bob and Mike. A roaring log fire was provided in the lounge each night providing a snug area to complete the day’s trip list and savour Casa Recuerdo’s excellent house wines. We would highly recommend Casa Recuerdo to anyone wishing to bird the area, as both a place to stay and to use Martin’s expert knowledge for local information and guided days out. Groan - The sham that is Madrid Airport, apparently it was designed by the same architect who designed Terminal 5 at Heathrow. It was probably designed on a Friday afternoon. Moan - The very unseasonable wet dull weather, which put paid to any decent photo opportunities. Groan - The skittish nature of the birds, making it almost impossible to approach them for any meaningful photography. Vultures in a feeding frenzy and then being put off the carcass by a dog; very reminiscent of the African plains just replacing Hyena for dog.  The whole spectacle of the natural behaviour being exhibited by the Imperial Eagles, especially the male, sky-dancing. Fields filled with thousands of Common Cranes and the air filled with their calls. Scanning the apparently empty plains to discover flocks of sandgrouse and bustard. 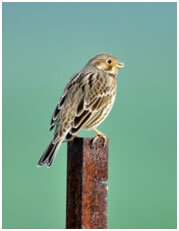 The vast flocks of larks, pipits, buntings and sparrows that needed very close scrutiny to separate the species. Finding a bush that contained House, Spanish and Tree Sparrows, a first for us, and not a spectacle we would suspect you would find in many countries. The whole experience that is stopping at Casa Recuerdo, especially drinking the house wine whilst drafting the trip report in front of a roaring log fire. The road network which has been upgraded; miles and miles of deserted roads making driving a pleasure once more.